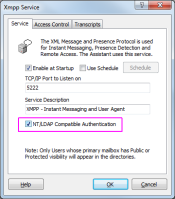 Mailtraq Professional provides a standard XMPP Service that allows the interconnection of any compliant XMPP 'Jabber' client. Many are available at no cost. This gives you your own private IM communication system in addition to email that works across the office or around the world. Standard desktop clients work across platforms so that you can connect from not only Windows machines with for example, Pandion, but also from Mac OS X using Pidgin or even from mobile devices such as using Xabber from your Android phone. Users can communicate using one-to-one or conferences style real-time discussions with other Mailtraq Assistant users. Unlike consumer-grade instant messaging offerings, Mailtraq provides the option to record and log discussions, either for audit purposes, or as a record for particpants. A popup appears near the system tray showing the sender and subject line of the email. This works both with traditional email clients and also with WebMail. MA is installed by each Local User (read more...) of Mailtraq on their own computer. Users created in the Console are by default not visible to Instant Messenger clients. The Administrator needs to set the Local Directory Visibility in the user's mailbox Properties dialog | Mailbox tab.